Only a few weeks after the announcement that it had been acquired for $180 million by X-Rite, the color mavens at Pantone have announced a major update to the industry-standard Pantone Matching System, the Pantone Goe System. 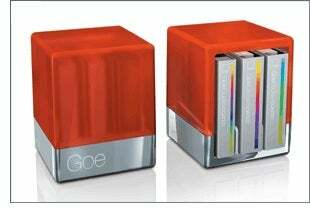 The Goe System was created to offer designers and printers a simpler, more complete color process from start to finish. The current Pantone Matching System (PMS) colors are created using 15 specific inks. The Goe System uses fewer inks—11, including a clear ink—but Pantone says that it has a wider color gamut than PMS. But the Goe System doesn’t really replace the PMS colors, at least not today. It complements it, especially when you consider that the older system has been around for more than 40 years, and will not just disappear overnight. First up is the new Pantone GoeGuide. The Pantone GoeGuide is like the standard fan-style guide you’re used to using, but the colors are arranged in a much more logical manner. Each page in the fan contains seven color chips ranging from dark to light with the “base” color in the middle. The colors start at one end of the spectrum and flow all the way throughout the entire GoeGuide. This is a huge improvement over the current system, where you might find yourself searching the beginning, middle and end of the PMS guide for a desired shade of blue. Each color in the Pantone GoeGuide is indicated with a unique three-part numbering system as well as the RGB values for the color. The second part of the Goe System are the GoeSticks, a two-volume set of adhesive-backed color chips which allow designers to peel off a color chip and place it on their layout or photograph without taping or glueing. Six chips for each color are provided. Also included is the Pantone palette playground, a test area to experiment with different color chip combinations. Once you’re happy with your color selections, you can permanently attach the chips to one of 30 provided Pantone palette cards to share with co-workers and clients. The full Pantone Goe System, including the GoeGuide, two-volume set of GoeSticks and myPantone Palettes software will sell for $499 and go on sale in October. GoeSticks with myPantone Palettes software will sell for $369. And if you’re on a tight budget, the GoeGuide and myPantone Palettes software will be available for $130. As of this writing, Quark has committed to bringing the Goe System to QuarkXPress 7, but Adobe has been silent on the subject. Hewlett Packard and Xerox have agreed to integrate the Goe System into their digital printing solutions, as have several large commercial RIP vendors. But the design and print world follows Adobe’s lead. But until Adobe fully embraces the new system, it isn’t going anywhere (bad pun intended). The other hurdle for Pantone will be breaking over 20 years of habit: PMS 367 is easy to remember, but 138-4-2 will take some time to get used to. If you’re interested in more info on the Goe System, CreativePro.com’s Gene Gable has a very expansive piece, with plenty of background detail on the product, the history of Pantone, and his speculation about X-Rite’s intentions in all this.